AOMEI Onekey Recovery is a software offering backup and restore system. You can use it to create a factory partition and store system, or you can backup system to external hard disk to save space of local disk. There are two packages offered to backup system for individuals and commercial use. AOMEI OneKey Recovery Professional will protect your personal computer easily. If you want to maintain more than multiple computers, you can buy AOMEI OneKey Recovery Family License. Once you backup system successfully, It will generate shortcut-F11 or A, you can set one of them as shortcut to enter onekey recovery environment during computer startup. For the computers with EFI/UEFI boot, you can enter into the program to restore your system by using Windows Boot Menu. Of course, AOMEI OneKey allows you to configure how to display the boot menu by options..
After backing up system, you can press a special keyboard button - F11 default or A key when your computer starts up to enter into Windows PE environment, and then automatically launch AOMEI OneKey Recovery. AOMEI OneKey Recovery offers encryption and compression function during backup. It can save your disk space, and protect your data from hacking. 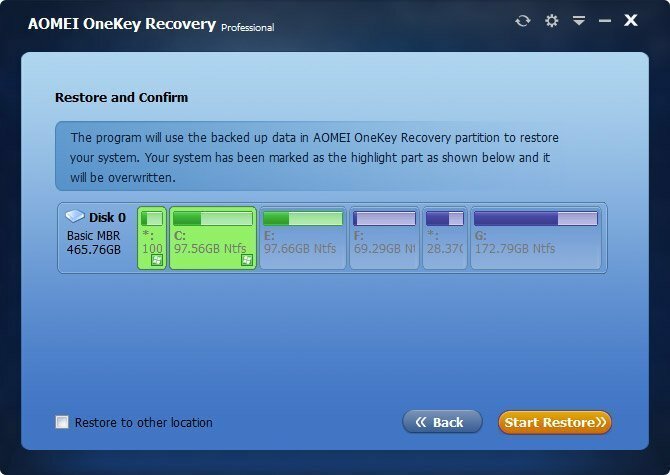 If you want to protect Windows system of mulptile computers within one company, and offer profitable technical supports for inviduals or organization, we recommend you to buy and download AOMEI OneKey Recovery Technician or AOMEI OneKey Recovery customization. Step 1. Buy and register AOMEI Onekey Recovery Pro or Server. Launch this software and you will see the interface like below picture. Select “Backup” option to backup. Step 2. 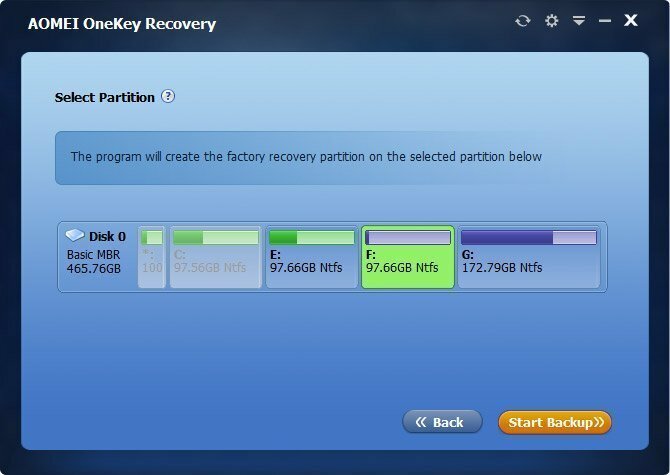 You can choose one of ways to backup system: to backup system to AOMEI OneKey Recovery Partition or to backup system to other location. Step 4. The backup process will be running automatically, and it allows you to do other operations using computer. 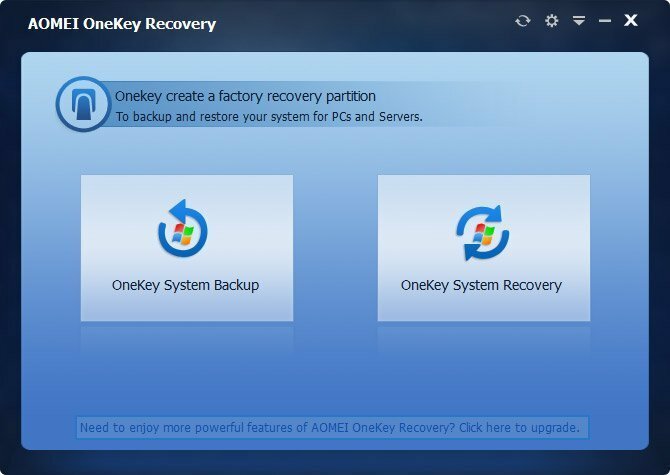 AOMEI OneKey Recovery is a free software that can help you to create a factory recovery partition, make system backups, restore backups in case your system crashes. 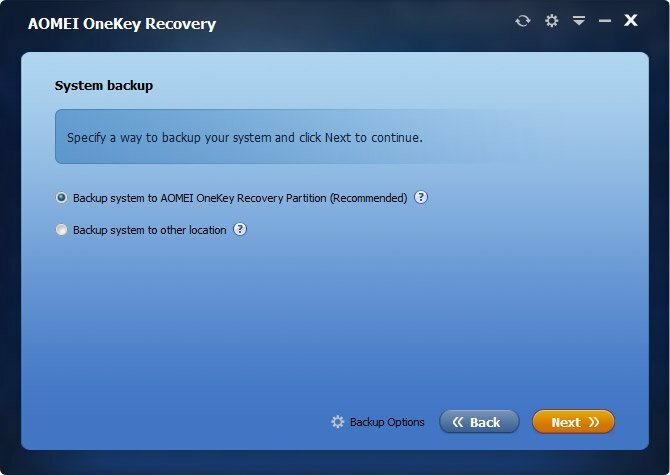 AOMEI OneKey Recovery allows you to perform full system backups and secure every document you have on the hard drive. Best Software for backing up and restoring Windows operating systems including Windows 10... I highly recommend it for all home users as well as business houses. It saved my time and frustration. My computer crashed suddenly when I was working. Thanks AOMEI OneKey Recovery. I restored my system successfully last night. AOMEI OneKey Recovery is awesome. Its team designed a red color UI for me. I think it is a unique and personal software belonging to me.